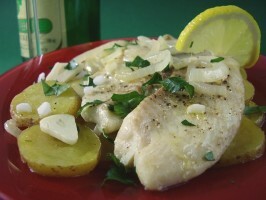 Another Corfiote fish recipe with an Italian-sounding name. Bianco is pungent with garlic and is called “white” because it is made without tomatoes. 1. Heat the butter and 1 tablespoon of the olive oil together in a large stewing pot or Dutch oven. Add the onions and garlic and cook over mediumlow heat, stirring, until softened, about 5 minutes. Add the potatoes, season with salt and pepper, and cook, stirring gently, until the potatoes are about half cooked, 10 to 12 minutes. 2. Place the fish in the pot over the potatoes, drizzle with the remaining 2 tablespoons olive oil, and add enough water just to cover the fish. Season with salt and pepper. Place the lid partially over the pot and simmer over medium-low heat until the fish is flaky and the liquid almost gone, about 20 minutes. Adjust the seasoning, pour in the lemon juice, and garnish with chopped parsley. Serve hot.